If you manage a website and would like to provide a link to our CFA site, we invite you to download one of the images below to use as a link. Simply right click on the image size of your choice and save it to disk. Please do not alter or change the image in any way. If you need the logo in a different size, please contact . Help promote our 2018 Annual Meeting in Little Rock, Arkansas, by printing the 2018 Annual Meeting flyer and delivering it to your local genealogy group, historical society, or public library. The CFA held its 2017 annual meeting September 15-16 in Tampa, Florida. A brief news release was provided for use by anyone who could help publicize the meeting. The CFA will hold its 2016 annual meeting September 9 and 10 in Greenville, South Carolina. This brief news release may be used by anyone who can help publicize the meeting. Tour leader Errol Chandler sent this press release to all the local media, newspapers, magazines, radio and television stations covering Somerset, where Wells is located. Similar releases were sent to media outlets in Hampshire and Wiltshire, locations of some of the other sites that will be visited. Help promote our 2015 Annual Meeting in Louisville, Kentucky, by printing the 2015 Annual Meeting flyer and delivering it to your local genealogy group, historical society, or public library. Help promote our 2014 Annual Meeting by printing the 2014 Annual Meeting flyer and delivering it to your local genealogy group, historical society, or public library. Will you be attending a family reunion or a genealogy society meeting? 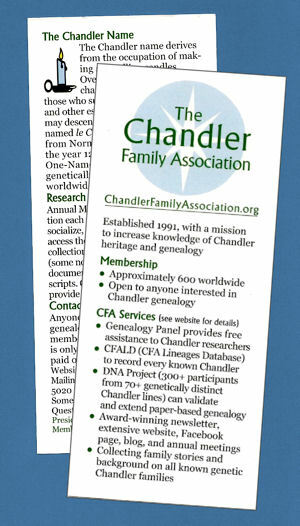 Please print a few copies of our information sheet to share with anyone who might be interested in Chandler genealogy or in joining our association. The information sheet and the brochure below have very similar content – but the information sheet can be quickly printed on your home computer. Professionally printed on 2 sides on coated paper, appropriate size for any brochure rack or for mailing. Contains general and historical information about the CFA, the history of the Chandler surname, and contact information for the association. This is intended as a membership recruitment tool. You might request some to take to a family reunion or genealogy conference, or you might need just one or two to share with potential members of your acquaintance. There is no limit to the number of brochures you may request, provided you have a firm intention to place them where they may attract Chandler researchers and potential members. Contact Helen by telephone at 901-355-5614 or email at to request the number of brochures you need.